During the 1950s a freight-only “cross country” railway line was proposed through the western suburbs of Melbourne, running from the existing lines south of Sunshine station, through the empty paddocks around Brooklyn, to a new saleyard complex at Derrimut then joining the Geelong line near Laverton station. 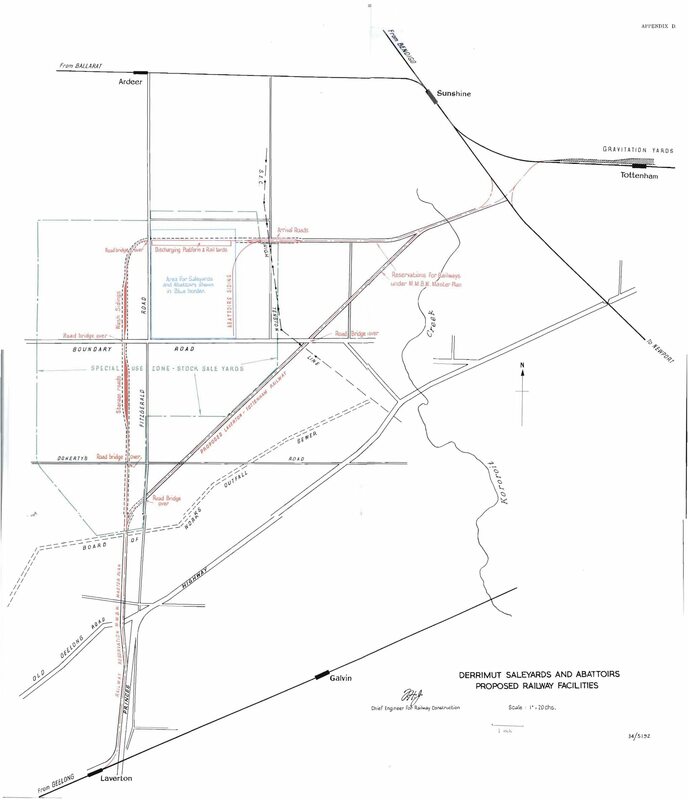 Conceived as part of the relocation of the Newmarket saleyards and abattoir complex to a new site at Derrimut, the intent of the railway line was to enable trains to bring cattle to market from country locations. 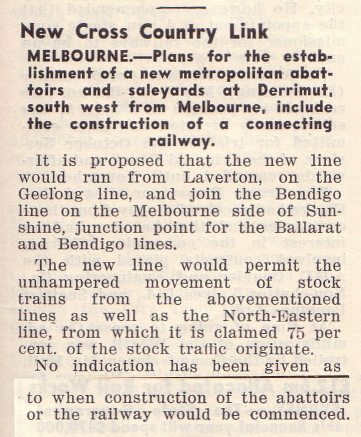 Over the next few years the saleyards and abattoir complex proposal for Derrimut stuck around like the smell of the same – this short article from the November 1957 edition of Railway Transportation shows the idea was still on the todo list. 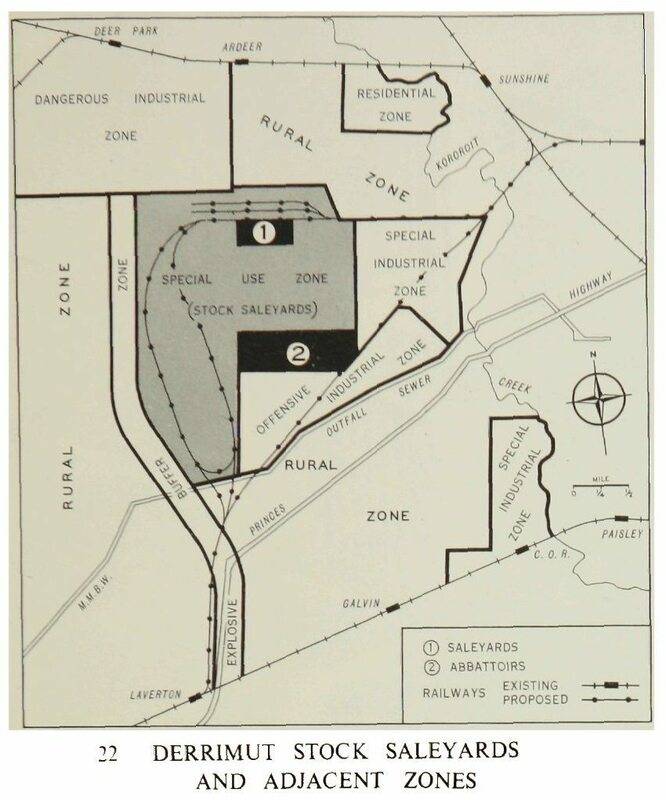 More detail of the proposed railway was given in the 1959 parliamentary paper ‘Report of the Interim Planning Committee on Derrimut Saleyards and Abattoirs‘. 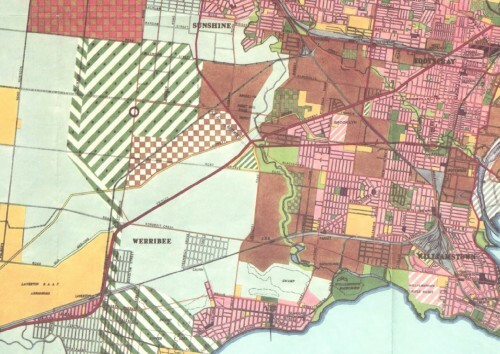 The report recommended the relocation of the existing Newmarket saleyards and abattoir complex to an area now adjacent to the Western Ring Road, along with associated railway arrangements. The report also included itemised costings from the Victorian Railways for their portion of the project, which included a direct railway from Tottenham to Laverton, as well as a number of sidings leading into the saleyards and abattoir complex. Putting £1,500,000 into the Reserve Bank of Australia’s pre-decimal inflation calculator, said works would have cost around $40 million dollars in 2012. Whether passenger trains for Geelong would have been routed via the new railway is doubtful – at the time freight trains from Western Victoria were forced to share the main lines all the way into Newport, with the new line resolving this. In addition, closer inspection of the diagram from the 1959 proposal only shows connections to the freight network at the Tottenham end of the new route – and none to the existing passenger network. Dependant on the relocation of saleyards and abattoir to Derrimut, the plan for the direct line died in 1961, when Victorian Premier Sir Henry Bolte announced that the project would not go ahead, with the decision made to improve the existing facility at Newmarket instead.